Habit: Annual to woody perennial herb; roots generally fibrous. Stem: generally round, hollow; nodes swollen, solid. Leaf: alternate, 2-ranked, generally linear, parallel-veined; sheath generally open; ligule membranous or hairy, at blade base. Inflorescence: various (of generally many spikelets). Spikelet: glumes generally 2; florets (lemma, palea, flower) 1--many; lemma generally membranous, sometimes glume-like; palea generally +- transparent, +- enclosed by lemma. Flower: generally bisexual, minute; perianth vestigial; stamens generally 3; stigmas generally 2, generally plumose. Fruit: grain, sometimes achene- or utricle-like. Genera In Family: 650--900 genera; +- 10550 species: worldwide; greatest economic importance of any family (wheat, rice, maize, millet, sorghum, sugar cane, forage crops, ornamental, weeds; thatching, weaving, building materials). Note: Generally wind-pollinated. Achnatherum, Ampelodesmos, Hesperostipa, Nassella, Piptatherum, Piptochaetium, Ptilagrostis moved to Stipa; Elytrigia, Leymus, Pascopyrum, Pseudoroegneria, Taeniatherum to Elymus; Hierochloe to Anthoxanthum; Lolium, Vulpia to Festuca; Lycurus to Muhlenbergia; Monanthochloe to Distichlis; Pleuraphis to Hilaria; Rhynchelytrum to Melinis. The following taxa (in genera not included here), recorded in California from historical collections or reported in literature, are extirpated, lacking vouchers, or not considered naturalized: Acrachne racemosa (Roth) Ohwi, Allolepis texana (Vasey) Soderstr. & H.F. Decker, Amphibromus nervosus (Hook. f.) Baill., Axonopus affinis Chase, Axonopus fissifolius (Raddi) Kuhlm., Coix lacryma-jobi L., Cutandia memphitica (Spreng.) K. Richt., Dinebra retroflexa (Vahl) Panz., Eremochloa ciliaris (L.) Merr., Eustachys distichophylla (Lag.) Nees, Gaudinia fragilis (L.) P. Beauv., Miscanthus sinensis Andersson, Neyraudia arundinacea (L.) Henrard, Phyllostachys aurea Rivière & C. Rivière, Phyllostachys bambusoides Siebold & Zuccarini, Rottboellia cochinchinensis (Lour.) Clayton, Schedonnardus paniculatus (Nutt.) Branner & Coville, Schizachyrium cirratum (Hack.) Wooton & Standl., Schizachyrium scoparium (Michx.) Nash, Themeda quadrivalvis (L.) Kuntze, Thysanolaena latifolia (Hornem.) Honda, Tribolium obliterum (Hemsl.) Renvoize, Zea mays L., Zizania palustris L. var. interior (Fassett) Dore, Zoysia japonica Steud. Paspalum pubiflorum E. Fourn., Paspalum quadrifarium Lam., are now reported for southern California (J Bot Res Inst Texas 4:761--770). See Glossary p. 30 for illustrations of general family characteristics. Scientific Editor: James P. Smith, Jr., J. Travis Columbus, Dieter H. Wilken. Habit: Perennial herb, cespitose. Stem: erect; nodes generally short-hairy. Leaf: basal and cauline; ligule membranous; blade flat or folded. Inflorescence: panicle-like; branches +- digitate or racemes, long-soft-hairy; axis segments grooved, breaking with age. Spikelet: paired, dorsally compressed; sessile spikelet bisexual, glumes > florets, membranous, florets 2, lower vestigial, upper fertile, lemma translucent, tip awned; stalked spikelet staminate or sterile, pedicel hairy; spikelet pair and subtending axis segment breaking as a unit. Fruit: oblong to fusiform. Species In Genus: +- 35 species: worldwide, warm temperate, tropics. Etymology: (Greek: pit, from pitted glumes of some species) Note: Cult for forage, revegetation. Reports of Bothriochloa exaristata (Nash) Henrard from Los Angeles Co. are unverified. Bothriochloa ischaemum var. songarica (Fisch. & C.A. Mey.) Celarier & J.R. Harlan, infraspecific taxa not recognized. Stem: clumped, 6--12 dm. Leaf: basal and cauline; blade 20--30 cm. Inflorescence: 7--14 cm; branches many, 4--9 cm, generally tan; axis segment with a wide membranous groove. 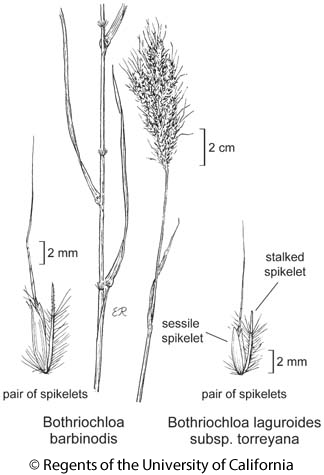 Spikelet: stalked > sessile, sessile 4.5--7.5 mm, lower glume occasionally pitted on back, lemma awn 2--3 cm; stalked 3--4 mm. Chromosomes: 2n=180. Citation for this treatment: Elizabeth M. Skendzic 2012, Bothriochloa barbinodis, in Jepson Flora Project (eds.) Jepson eFlora, http://ucjeps.berkeley.edu/eflora/eflora_display.php?tid=15890, accessed on April 19, 2019. SCo, s ChI, WTR, SnGb, PR, DMtns, DSon; Markers link to CCH specimen records. Yellow markers indicate records that may provide evidence for eFlora range revision or may have georeferencing or identification issues. Purple markers indicate specimens collected from a garden, greenhouse, or other non-wild location.